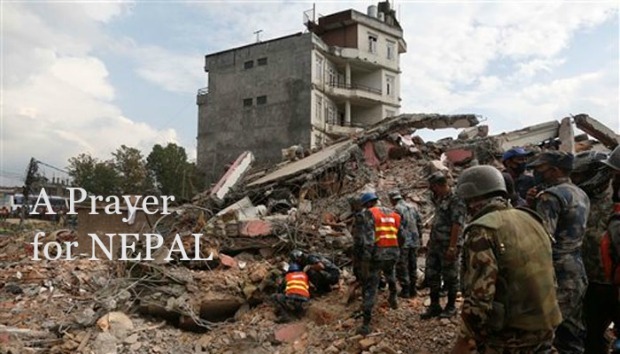 Dear God, we come boldly before your throne of grace and we lift up the people of Nepal who have just experienced such devastation, death, grief, sadness and pain through the earthquake that was visited upon them on April 25th, 2015. God may you pour your strength into them and lift them up with healing and hope from the depth of the valley of despair and loss – of lives and property. We pray that you pour down your oil of anointing to comfort them and may your Son be the everlasting light to shine through their darkness and gloom. May they draw near to you in faith as you draw near to them as their everlasting peace and solution to every problem that they are faced with as this time. For each one who have been traumatized by this situation, Lord may your blood touch deep within their heart, soul and mind to break the power of darkness to bring about a speedy healing of their wounded spirit. In spite of, may they put their trust, hope and confidence in you. We understand that there are many unanswered questions as it is so easy to think why such a loving and merciful God that you are would allow a plague such as the earthquake to disrupt their lives and their livelihood. Though we may never know why, we trust you that trials, tribulations, tests and affliction makes us stronger and more trusting of you in the end and that whatever you allow it is always an opportunity for us all to seek you for a better relationship and to turn our heart back to you as our Creator, Heavenly Father and the Savior of mankind through the death on the cross of your Son Jesus Christ. May your river of grace now run through every corner of Nepal and every person to lift up the fallen, to heal the brokenhearted, to mend their spirit and restore back to them that which was lost. Your word is forever true that blessed are they that mourn for they shall be comforted. We give you all the honor, glory and praise in the name of your Son Jesus Christ, amen. Let us light a candle and keep it burning bright as a symbol of hope and victory where Nepal will rise again. Please partner with us and share this prayer on your website and on social media so that others may be encouraged and inspired by it. There is power and strength in unity. God bless you richly for your obedience. Blessings in abundance upon you LaNette and all of Women With Gifts. Thanks for stopping by. Thank you so much Yvonne. We appreciate your support! That was very well written, and much needed as well for all those people in Nepal who have gone through such a lot – a great loss of life and property. But such are the ways and there is nothing one can do except pray from our ends. Yes, the government is sending relief and help with the hope to make a little difference, but the loss of so many lives really makes one wonder as to how much is enough. One of the fundamental beliefs that I have is that no matter what a person’s skin color or their religious beliefs is that we need each other at some point or the other. We need each other’s prayers and encouragement. The least that we can do is to reach out and hold the other person’s hand and to speak words of life, hope and healing into them. The rate at which things are moving today, we can never tell when it’s going to be our turn and would wish we knew of someone who was praying and believing God for a miracle that our lives can be turned around. I am happy to hear that the government is sending relief and help to the people and pray that it does indeed make a difference. Thanks for stopping and for letting us know your thoughts on this and also for sharing it with others. Blessings!